With the rest of the fleet and the ark destroyed, the Seraphs propel the Galactica into the future…a future ruled by the Eastern Alliance. In this future time period, the former Eastern Alliance is now known as the Eastern Empire. On page 6, Commandant Leiter refers to Apollo as a living legend. This is, of course, an ironic allusion to Commander Cain, who is known as a living legend among the Colonials. Leiter reveals that in this future time period, Terra and Earth are united and they have conquered the Cylon Empire. On page 8, panel 1, Apollo's word balloon is misplaced so that Leiter seems to be answering Apollo's question before he asks it. The logo of the Eastern Empire is seen on page 8 as being a lightning bolt between two globes. Not sure if it was intentional, but the design seems kind of phallic, if you know what I mean. The two globes are presumably Terra and Earth, given Leiter's explanation that the two worlds are united, but neither globe has continents that look much like Earth. On page 11, Apollo muses on how he has been working as a slave on the Eastern Alliance work detail for a secton. A secton is one week. On page 15, the stranded Starbuck is visited by the Seraph Elias on Planet Starbuck. This is another similarity to the "Return of Starbuck" episode of Galactica 1980 (as discussed in the study of "Journey's End" Part 1), in which Starbuck encounters a woman named Angela on the planet and, though it is not made clear in the episode, a later script, if the series had continued, would have revealed her as one of the Beings of Light. 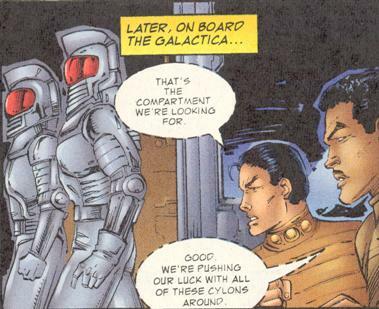 On page 17, the Cylons in panel 1, for some reason, are depicted with ridiculously large eye slits! I suppose it could be argued that the Eastern Empire has designed some new Cylon types, though they are not drawn so in any other part of the issue. Also on page 17, Apollo refers to Dr. Wilker as a cybernetics genius. In panel 1 of page 21, Apollo is suddenly wearing his Commander's jacket when he wasn't just a moment before. And then it's gone again in the following panels. In the lettercol of this issue, letter writer Gene Farris asks how many humans survived the holocaust in the Colonies and were stuck there after the fleet left. And did these survivors organize a resistance to the Cylon occupation? Although we never learn the answer in BSG70, the BSG2000 saga included stories of a guerilla resistance movement on Caprica after the Cylon attack. Given that there are a number of similarities found between BSG2000 and the expanded universe stories of BSG70 comics and novels, perhaps producer Ron Moore was inspired by Gene's letter! In what year in the future does this story take place? We're never told. Apollo guesses it must be dozens of yahrens (at least) for the Eastern Alliance to have advanced as far as they have. Even so, it seems unlikely that the Eastern Empire could have conquered the Cylons without help from some more advanced source; perhaps Count Iblis took a hand in it for reasons of his own? A more likely possibility is that much of what we're told about the Eastern Empire is propaganda and they are not quite as formidable and unconquerable as they make out to be. How is it that Earth has a significant enough population (and technology) to be a worthwhile ally to the Eastern Alliance/Empire? Just last issue, the fleet debarked from Earth with only Adam and Eve left behind!